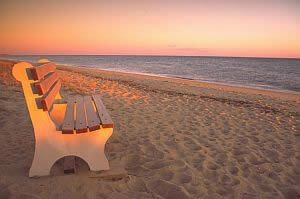 Location: On the border of towns of Hyannis and West Yarmouth, near Hyannis Harbor, Main St and Bayview Beach. Near Hyannis and Yarmouth beaches. 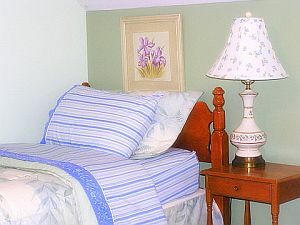 Lewis Bay Retreat is a recently renovated Cape Cod holiday rental in a secluded location near Nantucket Sound bay beach. 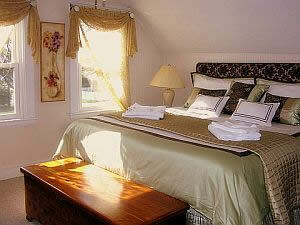 Privately situated yet very close to everything that makes for a great Cape Cod holiday. 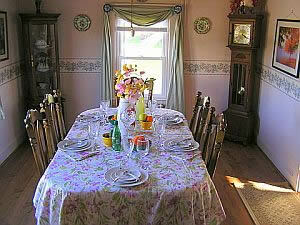 This lovely Cape Cod vacation rental is near Hyannis and Yarmouth beaches. Great location on a dead end street near conservation area, walking distance to the beach and entertainment! 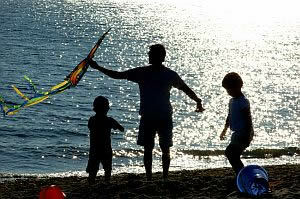 Enjoy all that Cape Cod has to offer without worrying about driving and parking! 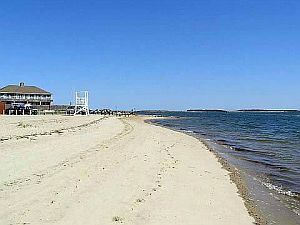 Free Barnstable Beach Pass, Free High Speed Internet Access, Phone, A/C Units, 2 Cable TVs, VCR, CD Player, 2 DVD Players, Playstation, Videogames, DVD library, Memory foam mattress pad, Featherbed, Full Kitchen, Microwave, Coffeemaker, Blender, Refrigerator, Cooking Utensils, Linens, Washer/Dryer, Gas Grill (BBQ), Beach Towels, Beach Chairs, Bicycles, Garden Swing, Basic Kitchen Staples, Paper products, Spices, 2 Bicycles. 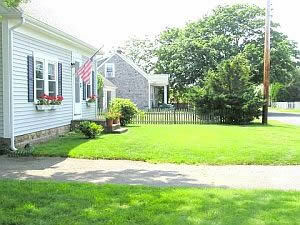 This is a 3-bedroom, 1 bath Cape Cod vacation rental located on a quiet dead-end street. Lewis Bay Retreat is a second house from the end of the street, away from main road. The street abuts 100 acres of conservation area with trails for walking, biking and dog walking. 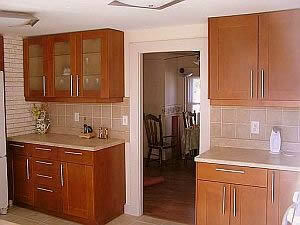 Our Cape Cod holiday rental home features a well designed, newly remodeled and fully applianced kitchen. 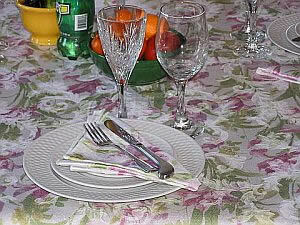 No longer cooking is a chore if you are in a mood for a home cooked meal. 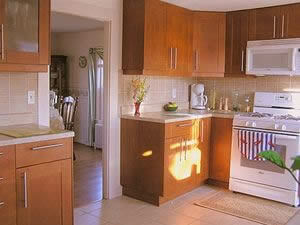 The kitchen is outfitted with all modern appliances, from a supersized fridge to an efficient dishwasher. Impress your family with a gourmet meal when you are in a mood for it! This Cape Cod holiday rental enjoys a great amount of sunlight. 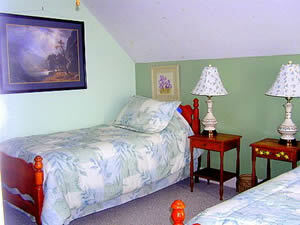 To cool off on a hot summer nights, the bedrooms are equipped with A/C units and ceiling fans. 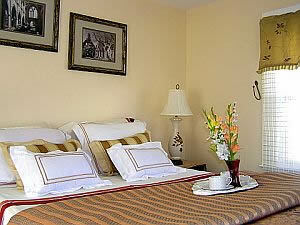 The bedrooms are equipped with firm mattresses supplemented by memory foam or feather beds for maximum comfort. 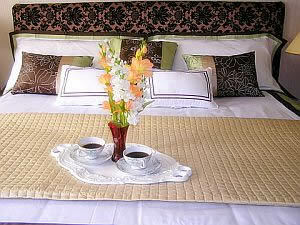 We provide our guests with bed linen of high quality, bath towels and beach towels. 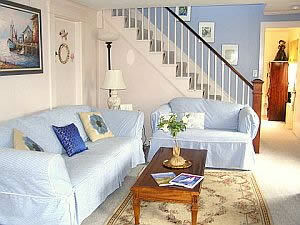 Our Cape Cod vacation rental has 2 floors, with 2 bedrooms on the upper floor and one on the lower. The bath is on the upper floor. One of the upper floor bedrooms has a king bed, the other two twin beds. These could also be converted into a king on request. "We loved the house!!! It was really perfect. I wanted to let you know that the two twin beds as a king worked great and the memory foam made it VERY comfortable!!! The sheets were also AMAZING!!! - says a recent guest from Maryland. Relaxation comes in many forms on Cape Cod and sometimes you just want to stay at home, enjoying the sea breeze and the sweetness of doing nothing. Our holiday rental has 2 cable TVs, VCR, 2 DVD players, PlayStation video game system, books and board games, for an occasional rainy day or a quiet evening in. 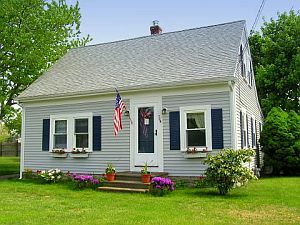 If you want to get online, our Cape Cod holiday rental has free high speed internet access via DSL - both wireless and with cable, so bring your laptop. Local phone service is also available free of charge. The queen bedroom downstairs provides comfrtuable bed with memory foam, its own TV/DVD/VCR and it looks out into the backyard. This vacation rental is outfitted and stocked with all expected home comforts. The washer and dryer will allow you to save packing space and enjoy fantastic shopping Cape Cod has to offer. Double bedrooms contains a futon bed. We supply a down featherbed for the double bed to make sure you get a good night's sleep. 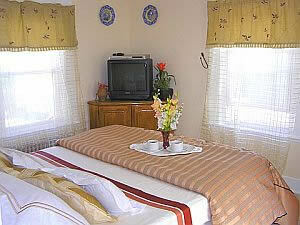 This bedrrom also has a second cable TV and DVD player for those preferring to watch a different movie or a program. 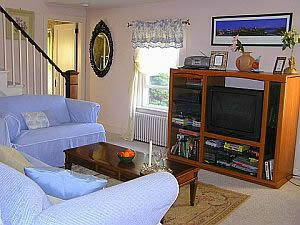 This 2-story Cape Cod holiday rental is situated within an easy stroll (5 minutes!) to a warm and gentle Nantucket Sound bay beach. 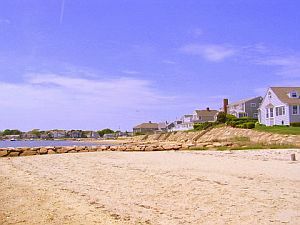 Walk 1/4 mile down the street from our Cape Cod holiday rental rental and you can swim, play in the sand, and enjoy the view of Lewis Bay and many boats that enter Hyannis Inner Harbor every year. 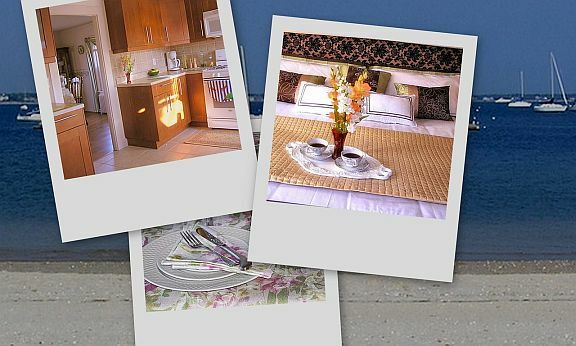 Our holiday rental enjoys a peaceful feeling due to its setting. Yet all of the excitement, recreation and plain old good fun is within your reach! 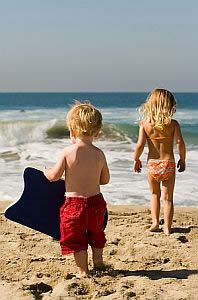 The neighborhood beach is a sheltered harbor beach, with small surf and many of our past guests found it particularly suitable for small children. If you are after open ocean beaches and more wave action, we provide guests at our Cape Cod holiday rental with a free beach pass. The local Bayview beach has free parking, lifeguards on duty and bathroom facilities. The water is warm and gentle, and stays so well into the fall. 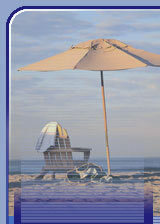 There are many fine beaches in Yarmouth within 3-5 mile radius of our Cape Cod holiday rental. 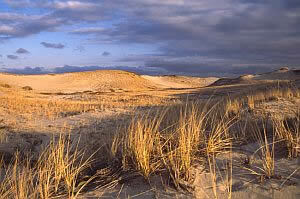 Seagull beach is our favorite in South Yarmouth - a great stretch of fine sand, dunes and lovely views to Atlantic. We also enjoy an eveining walk to Bayview Beach to watch the sunset at a whim, enjoy a picnic or just last beach adventure of the day. We keep a supply of beach toys for kids and adults in our Cape Cod holiday rental - beach noodles, plastic buckets for endless fun in the sun with little ones, a cooler to take to the beach and enjoy a picnic lunch, especially if you venture away from the neighborhood beach. We also have a couple of bicycles for your use. Another quarter of a mile along the shore will bring you to a stretch of private beaches - town of Yarmouth has access to water. These beaches are usually empty, have no boat traffic and are suitable for long walks. 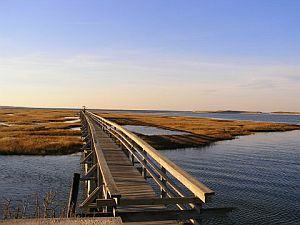 Or venture farther out to see the well known Craigville beach and lovely Sandy Neck beach with its sand dunes, marshes and a lighthouse. Whether you prefer spending your time relaxing outdoors, sipping a drink and enjoying a barbecue or looking for some world class dining, there is something for everyone! 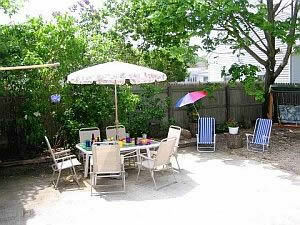 Our Cape Cod holiday rental has a fully fenced private backyard with a patio, outdoor furniture and a Kenmore gas grill. 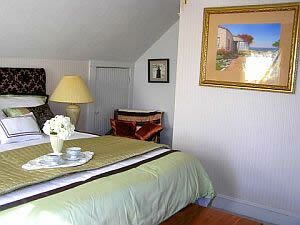 While you are staying at our Cape Cod holiday rental, your holiday possibilities are endless! Get out on the water in a cruise ship or sailboat; take a ferry and explore Martha's Vineyard and Nantucket; take a train that chugs through country farms and hidden fields; get a bird's-eye view from a plane or glider; or enjoy an afternoon of strolling and shopping - it's all within an easy reach. Hyannis Harbor and Marina with its ferries and cruises, Cape Cod Railroad and an airport all just a few minutes walk away from our Cape Cod holiday rental. Fishing enthusiasts would love an opportunity to take one of the deep sea fishing expeditions that leave from Hyannis Harbor - this area of Nantucket Sound is known as one of the best on the East Coast for bottom fishing. There are 5 great public golf courses and several conservation areas for biking and hiking are a short drive away. 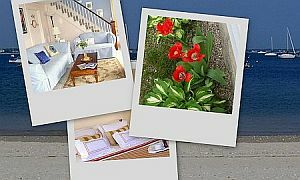 Or walk to Hyannis town center from our Cape Cod holiday rental - enjoy its eclectic and fun collection of museums, library, carousel, art galleries, lovely boutiques, fun-packed pubs, fine restaurants, bars, nightclubs, ice cream parlors, coffeehouses and bookstores. There is always something fun to do in Hyannis! For the serious shopper on a mission, Cape Cod Mall is 2 miles away. Walk to a number of harbor side restaurants, with lovely marina views. 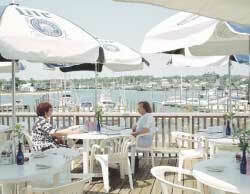 Tugboats restaurant is a 3 minute walk from our Cape Cod holiday renta. It features waterview dining and fresh American classics on its menu. 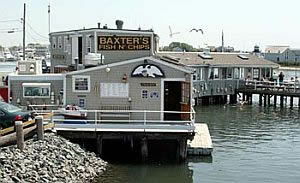 Baxters is another harbor side within walking distance and great seafood. See our photo album for more photos of Lewis Bay Retreat! Check out our location on a map .